Sad news! 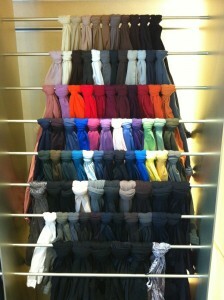 I just got an e-mail from Fogal in Toronto saying that they are closing down and having a great sale. Vancouver boutique already closed in the summer, and now Toronto location follows. When Vancouver boutique closed down, I remembered bad service experience and the fact that Wolford is around the corner, and thought that it’s no wonder. But Toronto boutique actually had really good customer service! One last boutique left in North American is in New York City. I have no news yet if it’s shutting down or not, maybe some New Yorker can tell me. Someone told me that this is their strategy now to close down the retail stores and start to sell Fogal brand in other big upscale department stores. 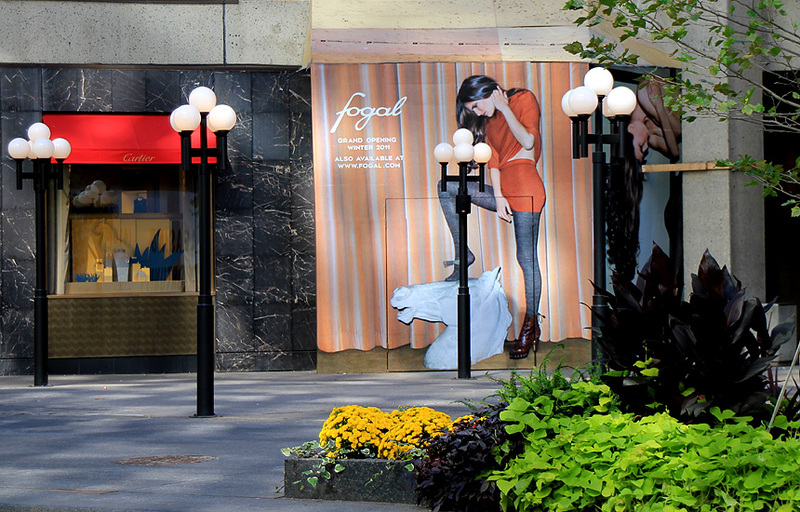 Fogal’s stay in Canada was quite brief (2012-2014), perhaps other legwear brands presented a lot of competition since not many people know even what Fogal is. Below is a photo of Fogal seamless Una tights from that boutique. 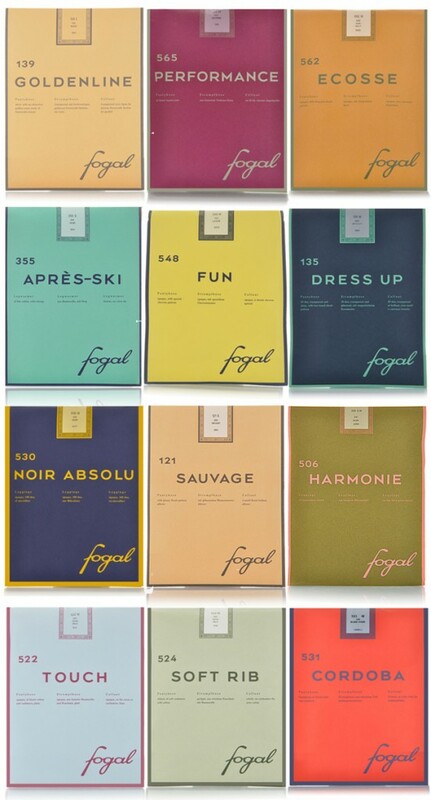 Fogal is one of my favourite brands for hosiery. They have an amazing reputation and quality. So far my customer service experiences varied, so I choose to only go to the location where I know it’s excellent – Toronto Fogal Boutique. Last time I’ve been to the Fogal store was 2 years ago, so I was really looking forward to another visit. One of my fans, David from Toronto, who helped me get more Fogal pantyhose before, invited me to go shopping there. As we approached the store, I was wondering if the same person, Melanie, who helped me last time was still there. To my delight, as I opened the door, there she was! Melanie even remembered that I was from Vancouver. Can you imagine that level of dedication to the clients? I told Melanie about my trip to Cuba and how I managed to wear Fogal Cuban heel pantyhose there. It was so much fun, I wanted to get something similar since Cuban heel is so rare to find these days. She told me about a style of pantyhose that is similar to the stockings used for the Great Gatsby movie with a fancy design on the heel. So I grabbed a few pairs, including an ultra sheer 6 den, and tried on the samples available in the store. Actually, I even had a look at the stay ups, but since fall is almost here, I decided to stick with pantyhose. Just for the record though, they are of very good quality. Melanie, another female associate, and David gave their feedback as I was putting on all the samples in the change room. The 2nd associate there (sorry, didn’t get her name) even gave me some tips on how to put on the backseam to make it straight. I would like to express my gratitude to David from Toronto for taking me out to the boutique and for buying these wonderful pantyhose for me. I ended up with new 3 pairs of Fogal (Brooke, Clelia, and 6 den) to take back to Vancouver and lots of good memories from the store. MangoRabbitRabbit blog just posted an awesome review! She looks adorable in both stay ups and mock stocking tights and I greatly encourage her to do more photos. In case you are wondering, this style is called Vilena and it is available at the shop section of this blog. 60 den stay ups by Fiore. My Facebook friend dedicates her hosiery purchase to me! I am so excited that one of my Facebook friends, Liz Anne, dedicated her purchase of tights to me! No one has ever done that before. That’s an original thought. Liz is a Toronto-based PR professional who helps musicians to gain maximum publicity. Liz is wearing Donna Karan pantyhose that she recently purchased. For me, it nice to know that someone things about me when buying a fashion pair of hosiery! When I was inToronto, I went to see the local Wolford boutique at Yorkville. They already had their fall collection out and I asked for permission to take some photos for my blog. At some point later I had a pleasant discussion with the manager, Olga, and she told me that she loved Wolford even before she started to work for the brand. It means a lot to me when people love what they sell even in their off time. I showed Olga my blog and she saw that I had a section for boys. I told her that some men tell me that they like to wear pantyhose, but they are afraid to actually show up to a store and buy it. It turns out that they have a lot of men coming to buy pantyhose and Wolford staff have no problem with men who have such preferences. However, another young staff wasn’t wearing pantyhose. I kind of wondered why and the manager told me that this girl just got hired and doesn’t know yet what’s required for the job. I’d add it into my work policy book! It was a good experience to go there and see what they have. Their boutique is much larger than in Vancouver. On Wednesday I got a chance to visit Toronto Fogal store with my pantyhose friend, David from Toronto. He is that Canadian gentleman who sent me some Wolford pantyhose to try out. Up to this point we only exchanged messages online, so I it was the first time that we got to see each other in person. Both of us were excited to meet and check out Fogal. As we walked in, we were greeted by a young lady named Melanie who was wearing fun tiger-print pantyhose. She asked what we were interested in and pointed out that some of the summer collection items were on sale. With her help I picked out to try 2 pairs – seamless low rise UNA pantyhose and backseam pantyhose with a Cuban heel called Belle Epoque. I also tried a shiny sheer pair, but it wasn’t quite enough shine for my concept of “shiny”. In total I tried on 3 pairs and I got Melanie’s and David’s opinions on how it looks and on what colour is best. I think that for probably half of my visit I was spinning in front of the mirror and checking out the perfect fit. The service was great! Melanie answered all my questions with enthusiasm. I learned a lot about the brand and I was especially amazed to see that they still have one style there that is 100% nylon. Turns out that some ladies wanted to have the same pantyhose that they bought decades ago and fell in love with. Melanie also gave me their fall catalog and a booklet with some history of the brand. Turns out they’ve been around for 90 years! I must admit that the service at Toronto location was much better than in Vancouver. Even though they had only one person working there, she handled everything very well. Melanie told me that she has a lot of Fogal hosiery at home and she buys multiple pairs of her favorite limited edition designs. To me it is important to see that staff are in love with the product themselves. It was a very nice visit and I walked out of there thrilled! It was very nice of David to get me the perfect “Welcome Back to Toronto” gift – 3 pairs of Fogal pantyhose. (Maybe some of you know that I used to live in Toronto for many years before I moved to Vancouver.) I now have 2 pairs of Una and one pair with the Cuban heel. Since then my hands were all over the package, but I didn’t open it just yet because I want it to be special. Fogal Boutique in Vancouver – New! Fogal store opened in Vancouver 2 months ago. They also have locations in New York, Chicago, and Toronto. I couldn’t believe what I was seeing. Fogal opened 2 months ago right around the corner, literally, from Wolford! They have stores in New York, Chicago, Vancouver, and Toronto. I went inside and the staff were friendly. They perked up when they realized that I was familiar with Fogal brand. I was wearing my Wolford pantyhose, Neon 40, with the shine effect. Right away I got compliments, questions, and even got presented with a similar item from Fogal line. I asked about seamless pantyhose, but turns out that Fogal does not carry such design. Correction: Yes, Fogal has seamless, but they don’t sell it at that boutique. People buy it online. Staff at the store didn’t know about this item. Staff were calling me by my first name and they even offered that I’ll try on samples. Yes, they’ve got a whole wall of samples that customers can try on before purchasing. Both customer service and the quality of product were really good. I only heard of Fogal from other hosiery enthusiasts, but I have never actually had a chance to try it, so I was very interested to have that opportunity. I tried on snake print and leopard print pantyhose, as you can see on photos here. Stay up stockings that they had on display also looked really good. I touched the double silicon lining and it felt like it would be comfortable on the leg, not like cheaper brands that either squash your leg or simply fall off. There were some points though that caused me to get a little concerned. First thing that alerted me though is that they don’t sanitize the samples in between. They tell clients to keep their underwear on when trying, but from my knowledge it’s not good to share socks since some people may have skin problems on their feet. Second, they destroy all samples once per month at the head office in Europe. Even staff can’t keep it for themselves. Why? Because it is a luxury brand, so that’s the proper thing to do, as I was told by the staff. Since you know how I am about stitching my pantyhose and reusing it, you can probably guess my reaction! I am not suggesting to exhibit flawed product, but there are charities like “dress for success” where women would appreciate donated used hosiery. Vancouver is a very eco-friendly city. It was a very nice experience overall to visit their store. The atmosphere is very high end and they have nice displays. I greatly recommend you to pay a visit. They gave me two catalogs to take home, but I couldn’t wait and looked through them as soon as I left the store. I am glad to see that serious hosiery brands are coming to North America and I hope that they’ll bring along a wave of femininity that will inspire women to dress beautifully. Wall of samples on display. Do people buy more pantyhose? 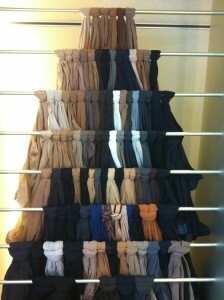 I recently read a statistic from UK that 75% of all hosiery sold are pantyhose. What does this mean? I don’t know, but in my opinion it is natural that women will buy more pantyhose then leggings because pantyhose wears out faster. Most runs happen at the toe nails and leggings are footless, therefore longer lasting. Annette leggings by Fiore – available at the shop section. Thus, I find such hosiery statistics a little misleading. But yes, there is some truth to it that as a result people buy pantyhose more frequently than leggings. 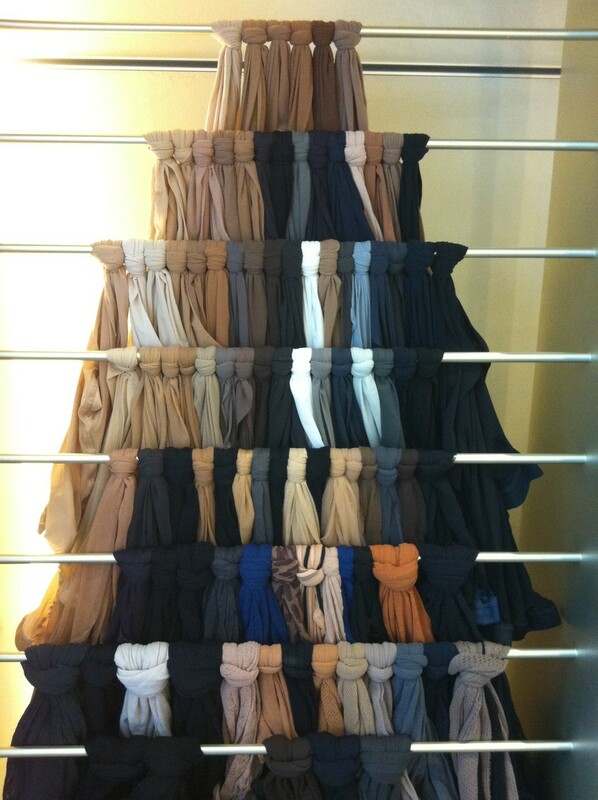 Let’s say that my friends complain that they buy pantyhose all the time. But they never manage to have that problem with leggings because those tend to be made of thicker yarn and they are not damaged by the shoes or toe nails.